Are you interested in applying? Please download the application & submit it to Timi Jorgenson at [email protected] by January 15th, 2019. The Journal of Financial Therapy primarily publishes clinical, experimental, and survey research that examines the empirical link between personal financial knowledge, attitudes, and behaviors and personal and family well-being. JFT also accepts cross-sectional survey research, longitudinal and panel study research, case studies, financial therapy practice management tutorials, and literature reviews. 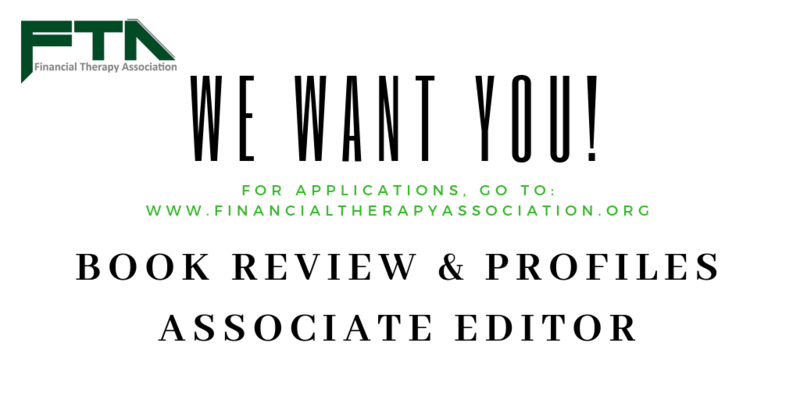 Articles from financial therapists, both those working in academia and in practice, are welcomed. All manuscripts received are blind peer reviewed. Because of the clinical focus of the journal, authors are encouraged to address the conceptual methodology underlying the research and to describe the intervention methods employed. Although detailed reviews of literature are accepted, reviewers tend to appreciate manuscripts with a very strong introduction describing the purpose of the study, a well described conceptual framework, concise presentation of findings, and a thorough discussion of results that are applicable to practicing financial therapists, financial counselors, psychologists, marriage and family therapists, and others who regularly work in clinical settings. The Journal of Financial Therapy provides a forum for those who are interested in financial therapy and financial counseling with a forum for sharing models, theory, ideas, strategies, and therapy approaches. Paper submissions are reviewed and accepted throughout the year. Visit www.jftonline.org to obtain more information about the Journal or to submit a manuscript.